Children love to imagine and explore the world of butterflies, with their variety of colors and fluttering wings. 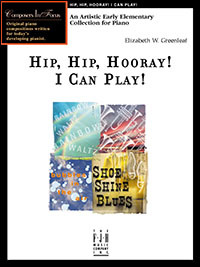 This collection provides a host of images through music and lyrics that can be used at the earliest primer level. Instruction begins with pre-reading pieces on both black and white keys, and then moves on to the staff. Contains teacher accompaniments. 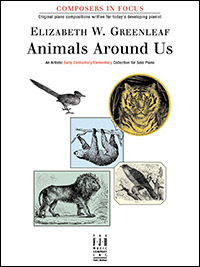 Nine charming pieces are included in this collection about some of the fascinating animals in our world. Under each title is an interesting fact about the animal and/or piece, and some of the pieces contain a teacher duet part. 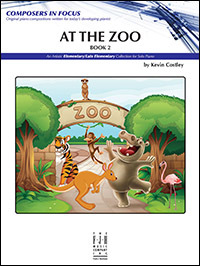 Students will really enjoy learning and playing a piece that depicts an amazing animal. What child wouldn’t want to visit a zoo? In this collection of ten pieces the animals take on human characteristics. 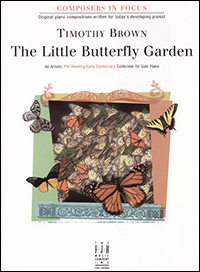 Whether it’s a graceful piece like Princely Peacock, a more ferocious piece like Lonnie Lion, or a funny piece like Fred’s a Monkey, the music in this collection is sure to motivate and appeal to young children. All pieces have lyrics and an optional teacher duet. 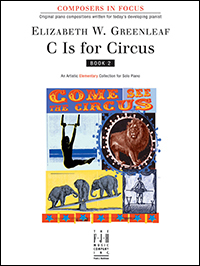 The composer celebrates the excitement and energy of the circus in this charming collection. These pieces don’t venture far from Middle C and provide excellent supplemental material for a beginning student. Very descriptive titles such as My Special Star, Still the Ancients Whisper, Castle on the Hill, Night Watch and others are engaging, expressive pieces that include lyrics and optional teacher duets. This enjoyable set of original piano solos features accessible patterns that make both learning and memorizing easy. Seldom venturing outside of Middle C position, these pieces illustrate a variety of keyboard techniques, touches, and articulations. Includes teacher duets. This wonderful collection offers the elementary student a musically enriching and imaginative experience. These fanciful pieces feature ordinary insects and extraordinary music! Beautifully written teacher duets enhance the fun! Hip, Hip, Hooray! I Can Play! This collection was written to correlate with most level-one method books. 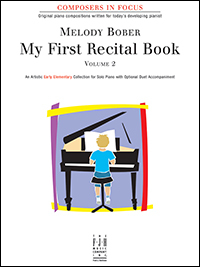 It provides a variety of sounds, moods, and touches for the elementary pianist. Written in both C and G positions, these pieces are sure to engage ad motivate students. These fanciful compositions describe scenes and activities that would be enjoyable diversions for any student. There are ten solos consisting of single-line melodies divided between the hands, with some use of hands-together technique. Optional teacher duets enhance the fun! 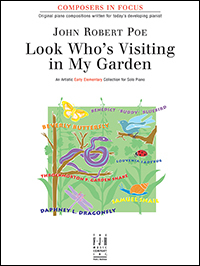 Imaginative early elementary collection features a different garden creature in each playful piece. The pieces are all one page in length, use simple, straightforward rhythms, and vary in tempo, character, and mode (easy keys). The emphasis is on five-finger patterns, while the dynamics are kept simple to allow students to focus on the varied articulations. My First Recital contains seven rewarding early elementary pieces with optional teacher duets. With their simplicity and richness of sound, they are ideal for a student’s first recital performance. 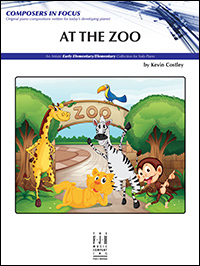 The selections may be utilized for lesson reinforcers, sightreading exercises, or learning just for fun. The various tempos, moods, meters, and keys represented in the collection provide strong teaching tools for the teacher and a wide variety of musical experiences for the student. 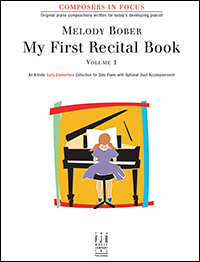 Volume 2 offers more attractive, fun-to-play solos that are perfect for a beginning student's first recital. 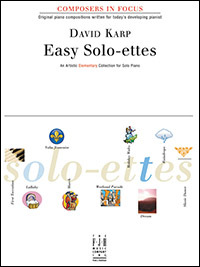 Written in a variety of styles, these solos with optional teacher duets will appeal to both girls and boys. There is very little hands together playing, yet the pieces are attractive and interesting because they cover a wide range of the keyboard and contain a variety of articulations and dynamics. This original collection of eight charming songs portrays a myriad of delightful childhood scenes. Students will especially love the accessibility of these five-finger melodies. Wonderful teacher duets are provided to encourage inspired, ensemble playing. 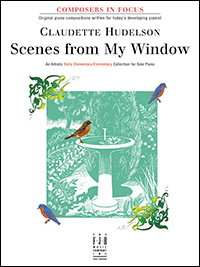 Scenes from My Window is a collection of 15 charming early elementary/elementary solos which include teacher accompaniments. These pieces portray different picturesque window scenes that students will enjoy playing. Each piece includes descriptive lyrics for students to sing along. Simply Silly is an imaginative collection of solo pieces that is sure to get your young students singing and laughing as they learn the piano. The music and lyrics encourage creative performance, and inspire students to become story tellers at the piano. In this collection of pieces, the composer takes us through a musical celebration of the sounds around us. 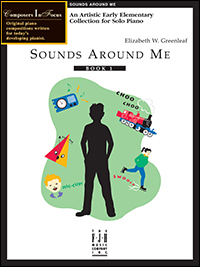 From a childhood favorite Squeaky Rocking Chair to smoothly gliding On My New Skates, Elizabeth Greenleaf has successfully captured in music and words some of the charm of the sounds we hear. 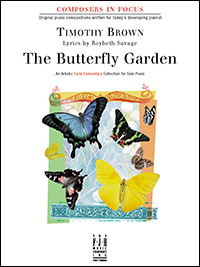 From the stately March of the Monarch to the Latin feel of Mariposa, composer Timothy Brown has musically captured the vivid colors and magical beauty of the butterfly. Most pieces are in Middle C Position ("butterfly position") and include teacher accompaniments. 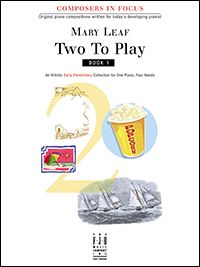 Two to Play, Book 1 is a wonderful collection of original pieces written in equal parts for early elementary students. Since equal part early elementary duets are sometimes difficult to find, these new original duets will become invaluable in your studio! 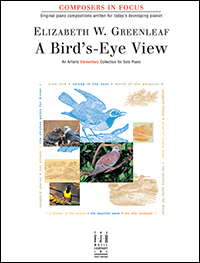 This musically descriptive collection of elementary pieces gives us a glimpse into the world of birds. By playing these charming pieces, students will be motivated by a variety of styles, dynamic levels, tempo ranges, and articulations. Contents include: March of the Penguins, The Silly Sandpiper, Struttin' Turkey Blues, and seven more "bird lover" tunes. 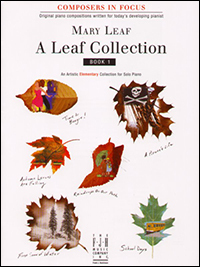 Book 1 of A Leaf Collection is a wonderful artistic elementary collection of original solo piano pieces. Inspired by the composers' own variety of experiences from different seasons, historical events, and different people, this collection is a collage of many things set to music. Students will have an assortment of themes in which to use their imaginations. 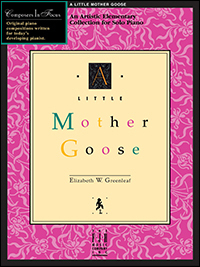 This imaginative collection of pieces is based on Mother Goose rhymes that originated in England hundreds of years ago. Written mostly in Middle C position, these charming melodies portray the fun and fantasy of the classic poems. What child doesn’t want to visit the zoo? 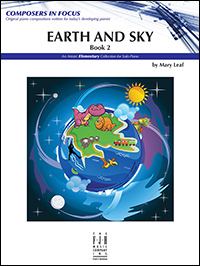 In this second book, each of the ten titles describes an animal. Whether it’s lyrical pieces such as The Graceful Swan and The Beautiful Flamingo, or humorous pieces like The Funny Chimpanzee and The Bouncing Kangaroo, the music in this collection is sure to have a motivating appeal to young children. Most pieces are positional (two with an optional duet) in the keys of C, F, G major and A, D minor. 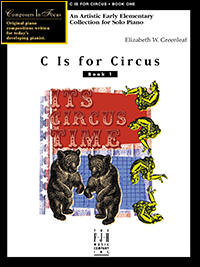 Students will relive the sights and sounds of their favorite circus acts as they play these fun-loving pieces. This creative collection provides a variety of musical experiences. Keys, modes, and moods combine with imagery that sparks the imagination! Students will rock with dinosaurs, watch meteors and comets racing in the night sky, and even ride a zip line! Some pieces have lyrics; all have an optional teacher (or sibling!) duet that is easy to play. 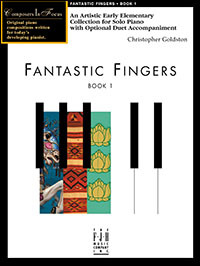 These imaginative and artistic solos, written to develop keyboards skills and musical awareness, are perfect for young students as well as adults. A diversity of sounds and styles will keep students motivated. These pieces are easy to learn, fun to practice, and exciting to perform. A few easy hand shifts occur, and there is light use of pedal. Titles include: First Toccatina, Valse française, March, and Slavic Dance.